Danikowski, K. M., Cheng, T. Colorimetric Analysis of Alkaline Phosphatase Activity in S. aureus Biofilm. J. Vis. Exp. (146), e59285, doi:10.3791/59285 (2019). 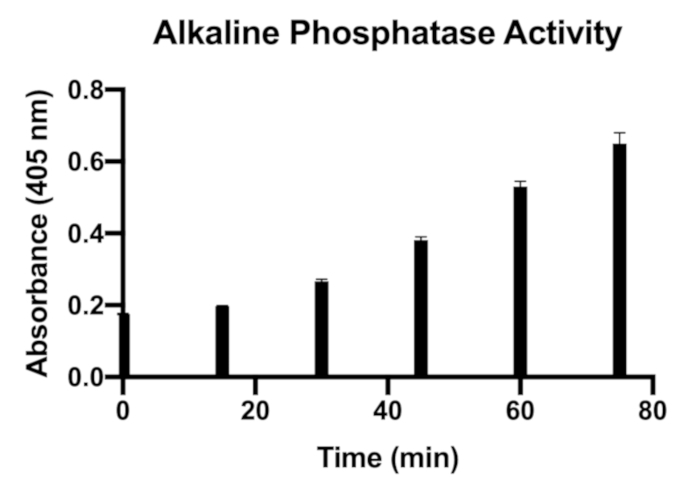 Alkaline phosphatase (ALP) is a common enzyme expressed in both prokaryotic and eukaryotic cells. It catalyzes the hydrolysis of phosphate monoesters from many molecules at basic pH and plays an indispensable role in phosphate metabolism. In humans, eukaryotic ALP is one of the most frequently used enzymatic signals in diagnosing various diseases, such as cholestasis and rickets. In S. aureus, ALP is detected exclusively on the cell membrane; it is also expressed as a secretory form as well. Yet, little is known about its function in biofilm formation. The purpose of this manuscript is to develop a quick and reliable assay to measure ALP activity in S. aureus biofilm that does not require protein isolation. Using p-nitrophenyl phosphate (pNPP) as a substrate, we measured ALP activity in S. aureus biofilm formed in 96-well tissue culture plates. Activity was based on the formation of the soluble reaction product measured by 405 nm absorbance. The high throughput nature of the 96 well tissue culture plate method provides a sensitive and reproducible method for ALP activity assays. The same experimental set up can also be extended to measure other extracellular molecular markers related to biofilm formation. Alkaline phosphatase (ALP) is ubiquitously expressed in both prokaryotic and eukaryotic cells1. It can catalyze the hydrolysis of monophosphate from different molecules such as nucleotides, proteins, alkaloids, phosphate esters and anhydrides of phosphoric acid. In humans, eukaryotic ALP is present in many tissues including liver, bone, intestine and placenta2. It plays important roles in protein phosphorylation, cell growth, apoptosis, stem cell processes as well as normal skeletal mineralization. Eukaryotic ALP is also a key serum indicator for the presence of diseases in bone, liver, and other tissues/organs when elevated3,4. Prokaryotic ALP has been detected in a variety of bacterial cells, including E. coli5, S. aureus6,7 and some common rumen bacteria in the soils8. Bacterial ALP activity has been used as a biosensor in the detection of pesticides, heavy metals9 and bacterial contamination10. The constitutive expression of ALP has been used to identify Staphylococci11 and to differentiate Serratia from Enterobacter12. It is further suggested that constitutive ALP production is correlated with pathogenicity in staphylococci13. Although ALP has been studied in different settings3,4, yet little is reported for its activity and function in biofilms cultures. A biofilm has been documented to have a differently functioning bacterial life as compared with its free-living bacterial cell counterpart14. In S. aureus, the formation of biofilm has been identified in a variety of clinical conditions and accounts for the antibiotic resistance and chronic inflammation15,16. Many molecules had been reported to be found in a biofilm matrix such as polysaccharides, proteins, nucleic acids, and lipids, but the mechanism of biofilm formation is not fully understood14. To understand the role of ALP in biofilm formation, we cultured S. aureus biofilms in 96 well tissue culture plates and measured the ALP activity using para-nitrophenylphosphate (pNPP). The molecule pNPP is a ready-to-use substrate for ALP and has been widely used to measure ALP activity6,17,18. This colorimetric assay is based on the conversion of para-nitrophenyl phosphate (pNPP) to para-nitrophenol resulting in a colored product at 405 nm. Compared to other conventional ALP assay, such as agarose gel electrophoresis19, wheat germ agglutinin (WGA) precipitation, and WGA-HPLC20, this assay is highly specific, sensitive, easy to reproduce, and most importantly, allows for high throughput. Prepare 1 L of Tryptic Soy Broth (TSB): Into 1 L of distilled water, add 15 g of pancreatic digest of casein, 5 g of papaic digest of soybean meal, 3 g of sodium chloride, 2.5 g of dextrose, and 2.5 g of dipotassium phosphate. Sterilize before use. For Tryptic Soy Agar (TSA), add 15 g of agar to 1 L of TSB, autoclave. Then let it cool down to room temperature. Next, pour at a ratio of 20 mL per Petri dish (100 mm x 15 mm). Biofilm culture medium: Add 10 g of glucose to 1 L of autoclaved TSB. Sterilize by filtration using a 0.2 µm filter. NOTE: The S. aureus biofilm is cultured as previously described6,21. Inoculate one individual colony of S. aureus from TSA in 10 mL of TSB and grow overnight at 37 °C. Dilute the overnight culture into 10 mL of TSB/glucose (10 g/L) at a 1:100 (v/v) ratio. Vortex gently to mix for a consistent concentration. Transfer 200 mL of diluted culture into a total of 18 wells (more for experimental groups, such a non-biofilm control to suggest a relationship to ALP activity6) from one 96 well plate. Use triplets for each time point: 0 min, 15 min, 30 min, 45 min, 60 min, and 75 min. See step 3.2. Incubate the 96 well plate at 37 °C for 24 h for biofilm formation6,21. Decant the supernatant by aspiration. Wash each well with 1x phosphate buffered solution (PBS, pH 7.4), centrifuge for 5 min at 15,000 x g and decant the supernatant by aspiration. NOTE: ALP activity was measured as described6,18. Add 75 mL of buffered ALP substrate consisting of commercially available pNPP to each well from step 2.6 and begin recording the time. Record each time point in triplicate. After incubation for a varied time: 0 min (control), 15 min, 30 min, 45 min, 60 min, and 75 min respectively, add 75 µL of 5 M NaOH to stop the reaction. Centrifuge the plate for 5 min at 15,000 x g.
Transfer 100 µL of supernatant into a new 96 well plate for colorimetric measurement. Measure the absorbance of each well at 405 nm using a 96 well plate reader. Use the 0 min time point wells to control for 405 nm background noise. Repeat the entire experiment in three individual 96 well plates. Figure 1 shows a representative result of ALP activity from biofilm cultures of S. aureus in 96 well tissue culture plates. 75 μL of commercially available pNPP solution was added to each well and incubated at room temperature. After incubation for different times (0 min, 15 min, 30 min, 45 min, 60 min, and 75 min, respectively) 75 μL of 5 M NaOH was added to stop the reaction. The product was then measured in a 96 well plate reader at 405 nm. Each time point was repeated in triplets from a single 96 well plate, and the entire experiment was repeated in 3 individual 96 well plates. Figure 1: S. aureus biofilm cultures were incubated with pNPP substrate for different time (0 min, 15 min, 30 min, 45 min, 60 min and 75 min) and their ALP activity was measured at 405 nm. Error bars represent standard deviation. Please click here to view a larger version of this figure. In our assay, we used pNPP as the ALP substrate. This is a working solution designed for ELISA and no dilution is needed. After hydrolysis by ALP, a yellow product develops and can be measured at 405 nm. At the end of the enzymatic reaction, we briefly centrifuged the 96 well plate and transferred the supernatant to a fresh 96 well plate to measure absorbance using the plate reader. We found that this extra centrifugation step is critical, since it increases the consistency of absorbance at 405 nm, probably by eliminating any possible suspended cells incurred during enzymatic reaction. For biofilm formation, we use 200 μL of a 1:100 (v/v) dilution for overnight culture as reported6,21. This is the optimum dilution for S. aureus to form biofilm compared to other dilutions (data not shown). Since the purpose of this paper is to measure ALP activity in biofilm, it was crucial that we maintained optimum biofilm culture conditions. This was further emphasized by the choice in using glucose at 10 g/L for optimum biofilm growth6. The dilution factor and glucose concentration need to be optimized if different bacterial cells are used for biofilm formation. During incubation of the biofilm culture with pNPP substrate, it will take time for the colored product to develop. We measured ALP activity after 15 and 30 min time points which is when the visible yellow color is observed. With the current concentration, we noticed an increased ALP activity for up to 75 min as indicated in Figure 1. After 75 min, no increase of the ALP activity was observed. Finally, since ALP in S. aureus is an exclusively membrane bound protein7, its activity can be tested without cell lysis. There are benefits to an enzyme activity assay that does not require whole cell destruction. Notably, the protein isolation process can sometimes yield a lower active enzyme quantity22. However, this protocol cannot be used if ALP is not in its membrane bound form. As previously reported6, ALP activity is elevated in biofilm culture as compared to its platonic counterpart. The experimental settings used in the current study can be extended to investigate factors/compounds that affect ALP activity in S. aureus biofilm. The findings from these studies will provide additional insight into how to control bacterial biofilm formation. We thank William Rainey Harper College and the University of Illinois at Chicago for the facility to conduct these experiments. We also thank McGraw Hill Foundation for their generous support. Para-nitrophenylphosphate (pNPP) Sigma P7998-100ML Typical concentrations of pNPP liquid substrates, often used in enzyme-linked immunesorbent assays (ELISA), range between 10 to 50 mM. Similar to most ready-to-use pNPP liquid substrates like the one used here, the exact pNPP concentration is not disclosed due to its proprietary nature. Coleman, J. Structure and mechanism of alkaline phosphatase. Annual Review of Biophysics and Biomolecular Structure. 21, 441-483 (1992). Sharma, U., Pal, D., Prasad, R. Alkaline Phosphatase: An Overview. Indian Journal of Clinical Biochemistry. 29, (3), July-Sept 269-278 (2014). Mitchell, M. S., et al. High frequencies of elevated alkaline phosphatase activity and rickets exist in extremely low birth weight infants despite current nutritional support. Boston Medical Center Pediatrics. 9, 47 (2009). Fawley, J., Gourlay, D. Intestinal alkaline phosphatase: A summary of its role in clinical disease. Journal of Surgical Research. 202, (1), 225-234 (2016). Derman, A. I., Beckwith, J. Escherichia coli Alkaline Phosphatase Localized to the Cytoplasm Slowly Acquires Enzymatic Activity in Cells Whose Growth Has Been Suspended: a Caution for Gene Fusion Studies. Journal of Bacteriology. 177, (13), 3764-3770 (1995). Danikowski, K. M., Cheng, T. Alkaline Phosphatase Activity of Staphylococcus aureus grown in Biofilm and Suspension Cultures. Current Microbiology. 75, 1226-1230 (2018). Okabayashi, K., Futai, M., Mizuno, S. Localization of Acid and Alkaline Phosphatases in Staphylococcus aureus. Japanese Journal of Microbiology. 18, (4), 287-294 (1974). Cheng, K. J., Costerton, J. W. Alkaline Phosphatase Activity of Rumen Bacteria. Applied and Environmental Microbiology. 586-590 (1997). Berezhetskyy, A. L., et al. Phosphatase conductometric biosensor for heavy-metal ions determination. 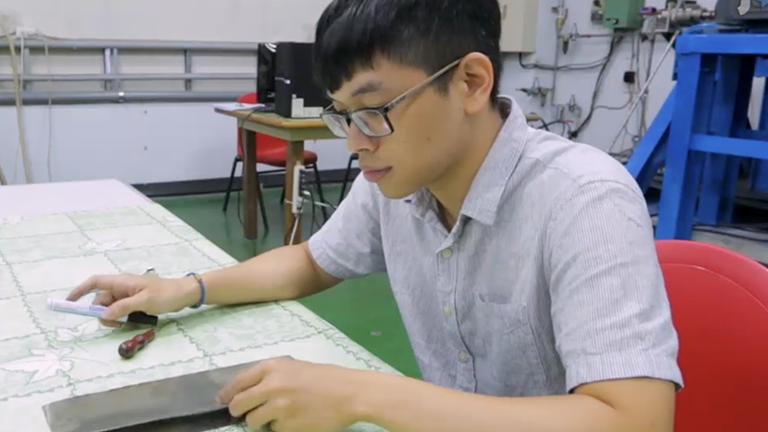 Innovation and Research in Biomedical Engineering. 29, (2-3), 136-140 (2008). Park, E. J., Kang, D. H. The use of bacterial alkaline phosphatase assay for rapid monitoring of bacterial counts on spinach. Journal of Food Science. 73, (5), M236-M238 (2008). Barber, M., Kuper, S. W. A. Identification of Staphylococcus pyogenes by the phosphatase reaction. The Journal of Pathology and Bacteriology. 63, 65-68 (1951). Wolf, P. L., Von der Muehll, E., Ludwick, M. A new test to differentiate Serratia from Enterobacter. American Journal of Clinical Pathology. 56, 241-243 (1972). Rangam, C. M., Katdare, S. M. Phosphatase activity of Staphylococci as an indication of their pathogenicity. Indian Journal of Medical Science. 8, 610-613 (1954). Flemming, H. -C., et al. Biofilms: an emergent form of bacterial life. Nature Reviews Microbiology. 14, 563-575 (2016). Hoiby, N., Bjarnsholt, T., Givskov, M., Molin, S., Ciofu, O. Antibiotic resistance of bacterial biofilms. International Journal of Antimicrobial Agents. 35, 322-332 (2010). Ito, A., Taniuchi, A., May, T., Kawata, K., Okabe, S. Increased antibiotic resistance of Escherichia coli in mature biofilms. Applied and Environmental Microbiology. 75, 4093-4100 (2009). Witherow, S. A Ten-Week Biochemistry Lab Project Studying Wild-Type and Mutant Bacterial Alkaline Phosphatase. Biochemistry and Molecular Biology Education. 44, (6), Nov/Dec (2016). Henthorn, P., Zervos, P., Raducha, M., Harris, H., Kadesch, T. Expression of a human placental alkaline phosphatase gene in transfected cells: Use as a reporter for studies of gene expression. Proceedings of the National Academy of Science USA. 85, 6324-6346 (1988). Horney, B. S., Farmer, A. J., Honor, D. J., MacKenzie, A., Burton, S. Agarose gel electrophoresis of alkaline phosphatase isoenzymes in the serum of hyperthyroid cats. Veterinary Clinical Pathology. 23, (3), 98-102 (1994). Farley, J. R., et al. Quantification of Skeletal Alkaline Phosphatase in Osteoporotic Serum by Wheat Germ Agglutinin Precipitation, Heat Inactivation, and a Two-Site Immunoradiometric Assay. Clinical Chemistry. 40, (9), 1749-1756 (1994). O’Toole, G. A. Microtiter Dish Biofilm Formation Assay. Journal of Visualized Experience. (2011). Nomoto, M., Ohsawa, M., Wang, H. L., Chen, C. C., Yeh, K. W. Purification and Characterization of Extracellular Alkaline Phosphatase from an Alkalophilic Bacterium. Agricultural and Biological Chemistry. 52, (7), 1643-1647 (1988).